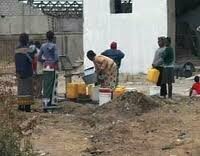 THE Civil Society for Poverty Reduction (CSPR) in North Western Province has called on Government to improve the basic infrastructure for the provision of water and sanitation. CSPR provincial coordinator Haggai Nyambe said in an interview that the organisation’s interest was towards the six pro-poor areas such as water and sanitation, health and education services, road and infrastructure, agriculture and social protection. He said the prioritisation of resources to key development areas as well as ring-fencing of pro-poor development strategies would greatly contribute to the improvement in the standards of living for the majority Zambians. He said the proper use of pro-poor budgetary resources and citizen involvement in management and execution of pro-poor resources which scored 41 and 21 percent respectively were some of the two indicators in the thematic areas. “This means that whilst there is allocation as poverty reduction programmes and other specific strategies being set by Government to address the challenges that the poor face, proper use of these resources remain problematic as there are still inadequate formal policies and governance processes which do not promote proper use of pro-poor budgetary resources,” he said. He said Government should also direct efforts towards reducing tax evasion and plugging loopholes for tax avoidance. He said that was important because there were many companies that were trying to avoid paying tax. ‘‘And also there is need to create new sources of revenue collection and in the same spirit control unnecessary expenditure,” he said. He called on Government to focus on creating a conducive environment for business and investment so that it attracted both local and foreign investment in various sectors.